Closet Solutions for old houses that were built without storage places. Houses built in the 1800’s have lots of character to them. You know, like drafty walls, single pained windows that let in lots of cold or heat, cold floors, creaky stairs, funny shaped layouts, no closets… character indeed. But they also can have wide woodwork, tall windows, wood floors, lofty ceilings, and architectural design you don’t find in todays new homes. Insulation can be added, layouts can be reworked, windows replaced, stairs and floors nailed down tightly, and furnaces installed. Back in the 1800’s the idea of building a closet into a room hadn’t really been invented yet I guess. Maybe because they didn’t have stuff to store? Or they didn’t have time to craft so they didn’t need to hoard a small mountain of crafty goodness? The clothes they owned were the ones on their backs and the set of Sunday-go-to-meeting set hanging on a peg behind the bedroom door? 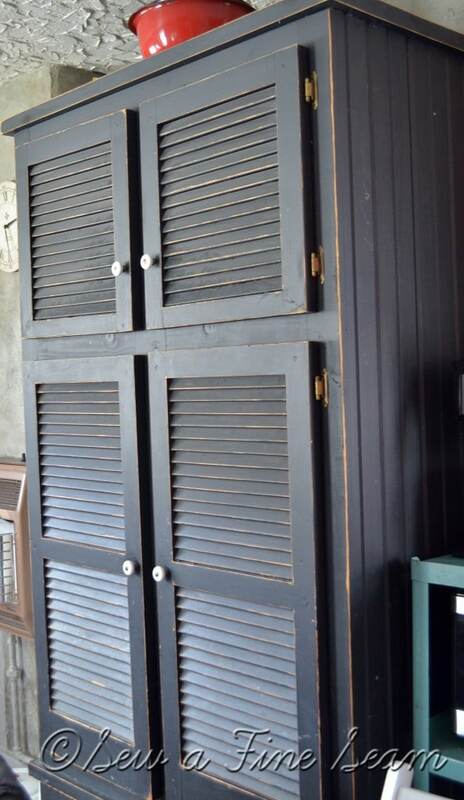 They preferred the look of an armiore to a built-in closet? Whatever the reason old houses just do not come with an abundance of storage space. At least mine didn’t. Which causes the need for some creativity to come up with closet solutions! Oh what wonderful awesomeness. They are metal, industrial, cute, fun, and they hold ‘stuff’. And they have a door that you can close to hide the ‘stuff’ inside! 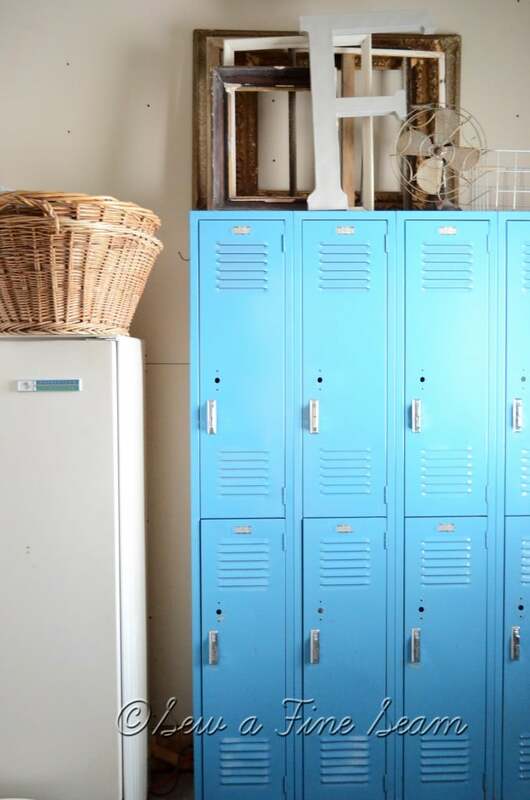 What is not to love about old lockers? 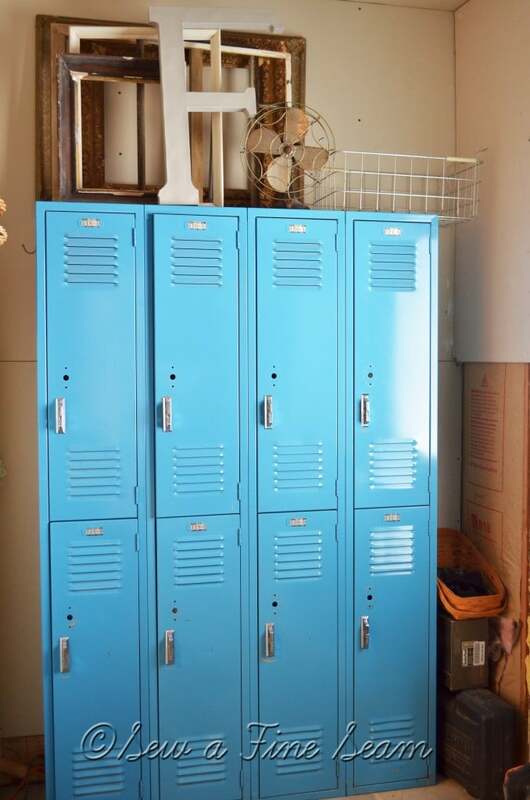 You can buy new lockers too – if I were building a house I would incorporate a string of new lockers somewhere simply because I love the look. Some sources for new lockers can be found here and here. Or just do a google search! I would most likely buy new ones in white. And I’m sure they would all end up full of ‘stuff’. This set of red lockers is in my work room. It houses mainly school things, the girls craft paints, a collection of old kids books, and some of the crafty things the girls have made. This set of lockers is in our still-in-progress laundry room. It keeps our jackets, coats, and boots hidden from view. One door contains our swim towels and suits. Another door is home to my plethora of bags that we grab when packing to stay at Grandma’s or need to haul stuff somewhere. No, they aren’t always this neat and tidy with the doors all closed properly. For some reason my girls don’t like to take the time to hang things properly so the door can be closed. No idea where they would get a trait like that 😉 At least I have the lockers to put the stuff in and close the doors though – before we found these we had a shelf with pegs under it here – it wasn’t pretty at all. 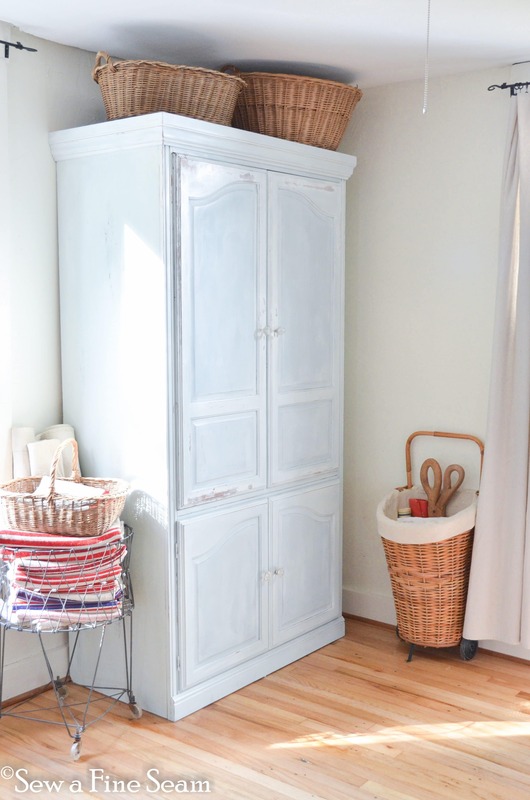 My husband built me this mammoth cupboard years ago and I used it in my sewing room for a long time, storing fabric and crafts. And a few of my larger kitchen items like my crock pot, and a few canned goods. We moved it to the kitchen a few years ago and now it holds all kitchen stuff. The cupboard has now been painted white for a few years. It’s been an awesome help in a kitchen that is sadly lacking in storage space. I painted it with milk paint and you can see more about that here and here. I’ve actually added two of these armoires to my work room. Much needed storage space for fabric and crafting supplies. I’ve also added an island to the room and I never see this much of the floor anymore!! Yes I need more space for the business – still praying about the rigth direction to go on that one. We do have closets in the bedrooms in our house – because my wonderful husband added them when remodeling the rooms. Both bedrooms occupied by our girls boast pretty large closets. Takes a lot of space from the room but it was worth it. Our bedroom has a small closet that we added. We make it work but I do dream of someday having a house with lots and lots of closet space. 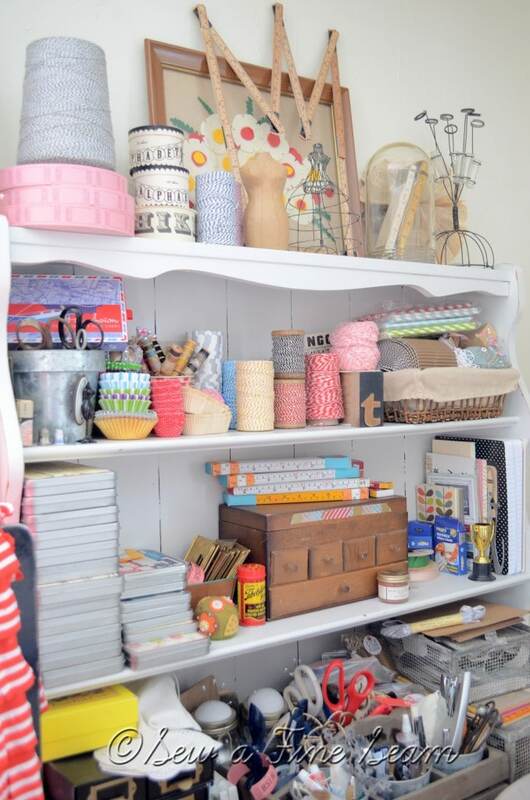 For now, I’ll just keep trying to be creative – and not hoard too much ‘stuff’. Do you have lots of closets or do you have creative storage space? Love the lockers!! I just convinced a friend to buy two sets a few weeks ago, because I didn’t have space for them. 🙂 We have plenty of closets and it still isn’t enough! Dressers of all shapes and sizes seem to do the trick in our house. The lockers are so cute. And I love the colors. I also love the closets in my new house. Our old house didn’t have closets in the bedrooms upstairs. We still have one room without a closet, although I could use the big closet for it, and may someday. I really love the upstairs in our new house and I think it’s partly because of the closets. I still love the old armoires, but they are not cheap and take up a lot of space. I like the colors of my lockers too. Although I have been contemplating painting the red ones white – shhhhhh don’t tell anyone! Some people have every kind of fit when I mention painting something else white! What a handy husband! How wonderful that he was able to give you some closets. 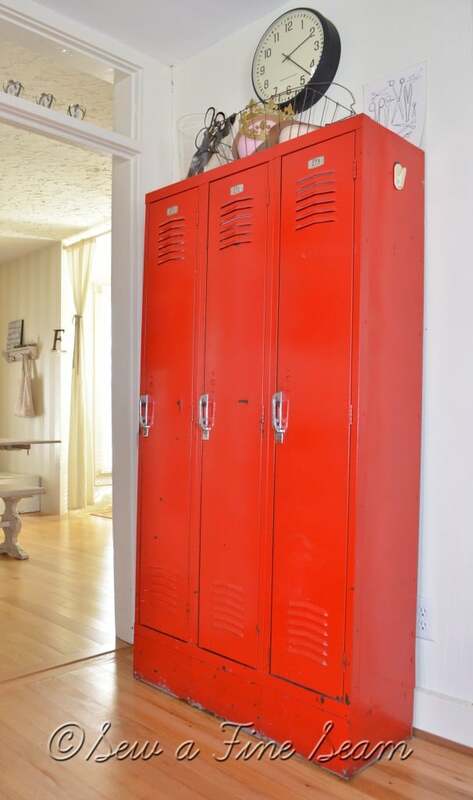 I love that you founds some beautiful lockers to use in addition to your closets, though. That is a brilliant idea and so interesting to look at. Thanks Judy, I love it too! It was a $45 purchase at a school auction! If that red locker goes missing, I don’t know anything about it. 🙂 Even if it ends up in my house. I love that look so much! 🙂 Thanks Kelly! Good luck getting it out of here without me know it – that thing is HEAVY!! LOL! Such great storage pieces you have! Love the lockers! They have such a cool industrial vibe! I like the industrialness of them too Lisa! 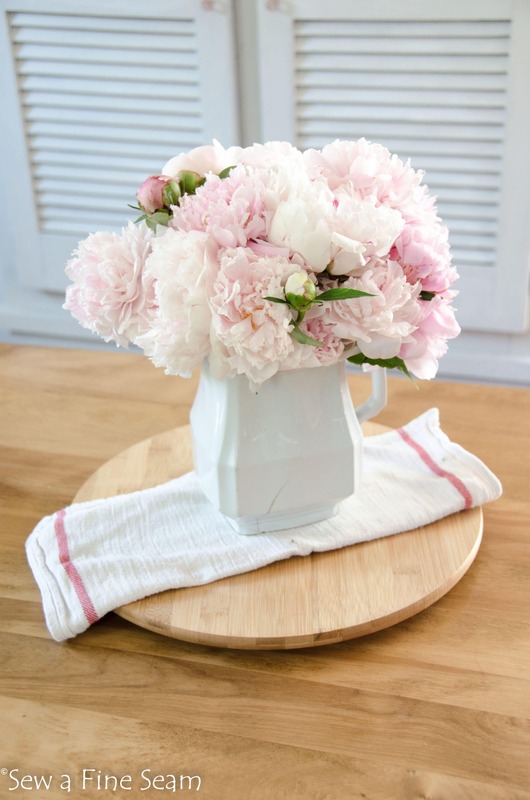 So funny, Jill ~ I have to be creative with my storage in our little old house, too! We had a set of lockers just like your first photo, but after years I grew tired of them, they sold on Craigslist in a heartbeat! Pam I cannot imagine getting tired of them! Do you think I might??!!! And I’m sure if I do I will have no problem getting someone to take them off my hands. I can probably make money on them too! You might be envious of closet space but others are envious of your lockers. We’ve all got some things someone else wants. I can’t believe you have two sets. So cool. Those are hard to come by here. I live in a house that doesn’t have tons of closet space, and our closets have the worst old sliding doors that need a good kick to work, some of the doors are long gone, with makeshift replacements. I don’t know why we didn’t fix those back in the 80’s when we bought the place, but we were young and this place needed so much work. There were many things we never got to. Sometimes you learn to live with things, right? Love your lockers, especially the red ones. They look so beautiful in your home.